When a solid target, such as solid copper or tungsten, is bombarded with electrons whose kinetic energies are in the kilo electron-volt range, electromagnetic radiation called x rays is emitted. Our concern here is what these rays-whose medical, dental, and industrial usefulness is so well known and widespread-can teach us about the atoms that absorb or emit them. 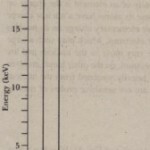 Figure 41-14 shows the wavelength spectrum of the x rays produced when a beam of 35 keV electrons falls on a molybdenum target, We see a broad. 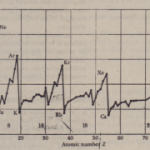 continuous spectrum of radiation on which are superimposed two peaks of sharply defined wavelengths. The continuous spectrum and the peaks arise in different ways, which we next discuss separately. The cut of wavelength is totally independent of the target material. If we were to switch from a molybdenum target to a copper target, for example, all features of the x-ray spectrum of would change except the cutoff wavelength. CHECKPOINT : Does the cutoff wavelength Amin of the continuous x-ray spectrum increase, decrease, or remain the same if you (a) increase the kinetic energy of the electrons that strike the x-ray target, (b) allow the electrons to strike a thin foil rather than a thick block of the target material, (c) change the target to an element of higher atomic number? A beam of 35.0 keY electrons strikes a molybdenum target, generating the x rays whose spectrum is shown in What is the cutoff wavelength. SOLUTION: The Key Idea here is that the cutoff wavelength Amin responds to an electron transferring (approximately) all of its energy to an x-ray photon, thus producing a photon with the greatest.possible frequency and least possible wavelength. From Eq. 41-23, we have.